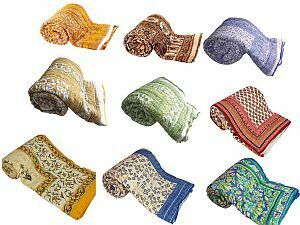 Panpaliya presents wholesale lots of assorted mix designs of Cotton Quilts. 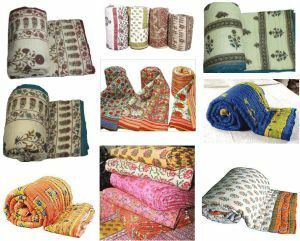 These wholesale lot of Jaipur Printed quilts, all in various ethnic Indian tribal Prints, hand Block print quilts, cotton quilts, wholesale lots quilts, mix assorted cotton quilts, stock lots quilts, colors and designs, is a must to complete your collection. 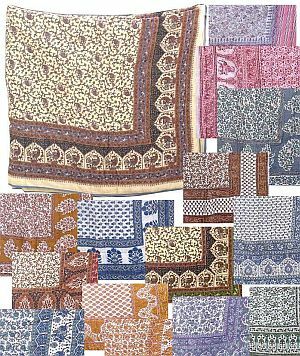 The various prints, motifs and borders in Bohemian tribal prints gives an exclusive Look. With more than 100 different designs regularly produced, this lot is a must for your store collection and customers. WHOLESALE LOTS CONSIST OF ASSORTED DESIGNS AS DESCRIBED IN DETAIL "BUT" SIMILAR TO THE REPRESENTATIVE PICTURES GIVEN. These Wholesale lots are designed especially for retailers, store owners & wholesalers who buy products on a frequent basis, need a wide variety OF design options, and do wish to purchase all their product in volume quantities AVAILABLE ANY TIME IN STOCK.